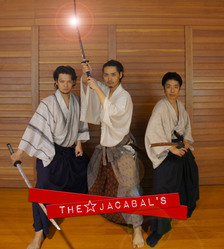 THE☆JACABAL'S is a Japanese stage combat group that creates screenplays based on historical facts with an added sense of humor. Their performances contain sword fighting with a mixture of dance-like moves that provides laughs and delight to their audience. THE☆JACABAL'S have performed their theatrical acts in major cities and for people of all ages.